AMC Acadia National Park Map, 2017. Cartography by Larry Garland. Excellent color trail map (tyvek, 100-foot contours) shows hiking trails and carriage roads and ponds/lakes. One side shows entire park at 1:42,240 scale; reverse has detail map of eastern section of park at 1:25,000 scale with insets for Schoodic Peninsula and Isle au Haut. 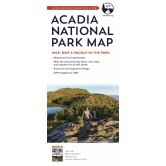 The maps are keyed to 50 hikes, bike rides and paddles in AMC's Outdoor Adventures: Acadia National Park.. Also shows boat ramps, kayak put-in locations. Folded to 4” x 9."